Supplier & Manufacturer of Powder Coating Extruder. Our product range also comprises of Powder Coating Plants, Pre Mixer Powder Coating Machine and Twin Screw Extruder. We are counted amongst the leading names in the industry, offering wide array of Powder Coating Extruder Plant that are manufactured with accuracy. 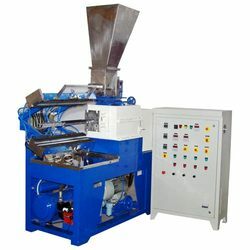 Powder Coating Extruder Plant is quality assured and ensures wide applications. Looking for Powder Coating Extruder Plant ?